Coming off a victory in going away fashion, some might have noticed Dustin Johnson feeling a bit more comfortable on the greens. The world #1 struggled at the end of last season rolling the rock, so he decided it was time to take stock and look into it a bit further. 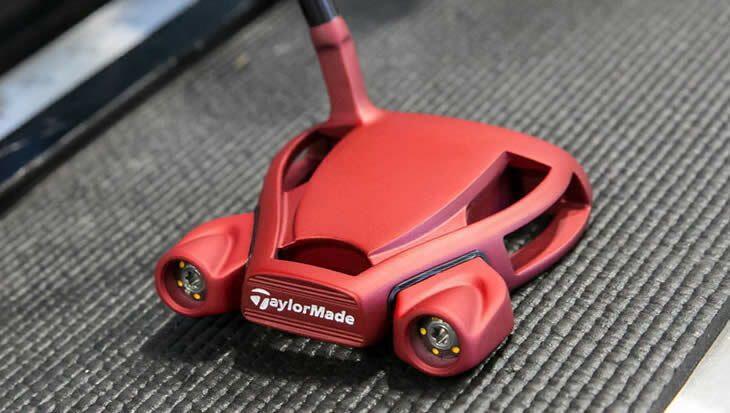 Meeting with Keith Sbarbaro at the TaylorMade putter lab in Carlsbad, the tour team went to work building identical putters with different sight lines and he found something that clicked and worked better than he imagined. We wanted to dive a little deeper into this story and that means another episode of Quick Six, where we get to the bottom of the news in the six questions you want answered most. 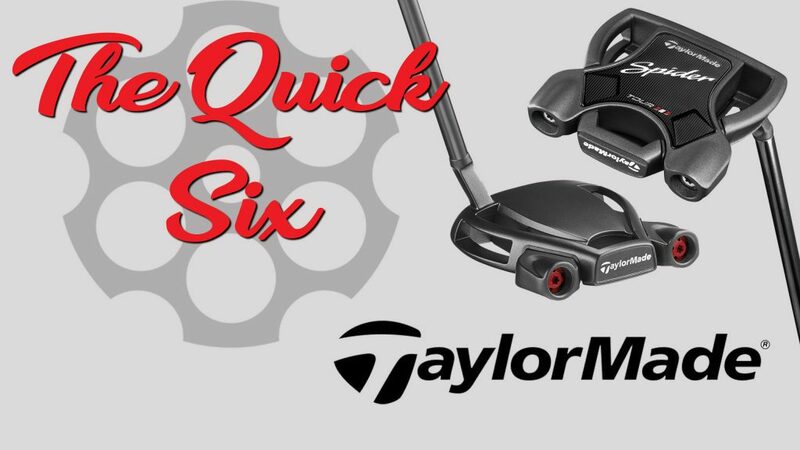 We spoke with Bill Price and Duane Anderson from TaylorMade to get all of the details. THP: After DJ struggled at the end of last season, what were the biggest changes he made coming into 2018? TaylorMade: To say he was struggling is a bit of an exaggeration; he did win the Northern Trust in the FedExCup Playoffs, and in his only fall event held a six-shot lead before he struggled with the putter on Sunday. He just wasn’t playing his best because of the injury at Augusta; I believe it was all physical. It was a very severe fall and it took a while for his body to get back to normal. As far as a change, I wouldn’t necessarily call it a change, per say, but it was getting back to full strength and healthy for the start of the ’18 season. Equipment changes, he’s got the P730s in the bag alongside his new Spider Tour — in addition to the new M4 driver and M4 fairway. He’s added a MG Hi-Toe wedge this year, which as you saw in Kapalua, was a valuable club for him. THP: You hear a lot about personal and mental playing a large role in putting, is their more science behind it than many believe? TaylorMade: I agree that putting is very personal and the mental/feel aspect plays a large role in success. However, as in any kind of club fitting, science can play a significant role in making sure that the clubs in your bag are suited for your swing or stroke. We use technology to test and verify that a putter is working with a players tendency, and not against it. With this data we can help the player understand what those tendencies are, and find a piece of equipment that can help them be more successful. The last part is to make sure that the putter is setup correctly from a specification standpoint so that the ball is rolling correctly down their intended target line. In the end, we can use art and science together to help the player choose the correct putter for them, and ensure that it is setup to the correct specification for their stroke. Of note: One example is Jon Rahm. Every time Jon comes to HQ and visits the putter lab he’s won the very next week after his visit. The putting lab provides immediate feedback and Jon has been able to adapt to small changes. We’ll keep working with him if he keeps performing like this! THP: How much does sightline play a role in putting at the highest level? TaylorMade: We all visualize our target line very differently when putting. Some players use the leading edge of the putter to create a 90 degree perpendicular visualization of target line, and can struggle with a large alignment tool or sightline. Others depend on that long significant alignment tool or sightline to aim well. DJ was somewhere in the middle. He used a Black Spider Tour with no sightline for the majority of the ’17 campaign but we found in the lab that he was much more successful with a short line with a “T-Line” alignment aesthetic. The benefit of using technology to measure these things is that we can figure out a players tendencies for face angle at address and impact very accurately — and quickly. Many times players at the highest level of golf have already found what works best for them through trial and error, so the process can be quicker. However, all golfers can benefit from a session like we had with DJ to find the putter with the correct alignment lines/design for their stroke. THP: No sight line has become quite common, as players shift, will we see a dynamic shift in the retail environment as far as what is released? 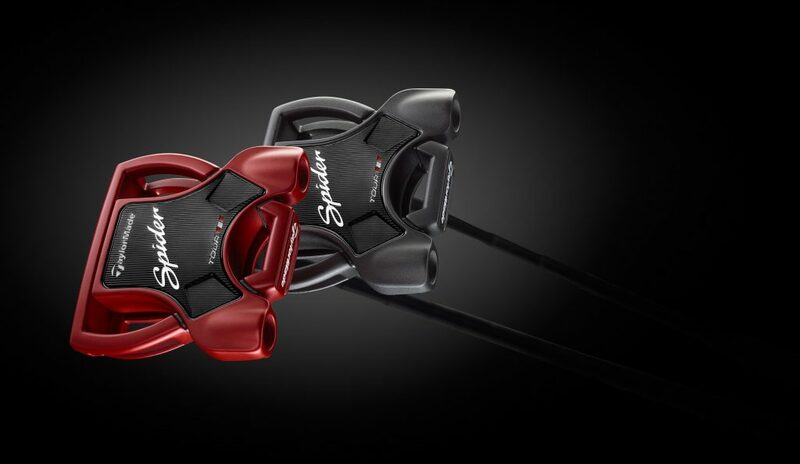 TaylorMade: The “no sightline” with the Spider Tour Red was first released with Jason Day, which he used to finish with the best statistical season in PGA TOUR history (in the era stats have been tracked), rising to #1 in the world in the process. Jason explained that the no sightline model helped him focus more on his speed. For him, a line was more of a distraction. With his success in 2016, the popularity of the “no sightline” model exploded — requests were coming in from everywhere; players and consumers alike wanted to get their hands on it. So, with DJ getting fitted in December and winning the first week he put it into play at Kapalua, we certainly anticipate not only more players adopting this style of sightline (or at least experimenting with it) but consumers to be asking for them in the near future. THP: How many changes take place like this during the offseason as a player tests new equipment? TaylorMade: The offseason is when most of the players will analyze their opportunity to get better and to test the new products for the upcoming year. However, for most players the opportunity to test and change their equipment at the start of every year from January through March. THP: What types of drills would you recommend when choosing a sightline to match your stroke and eye? TaylorMade: One of the best drills to improve face angle at address and Impact is the chalk line. Players can use the chalk line to check the face angle at address before the putt, and receive immediate feedback about whether the face was square at Impact by how well the ball rolls down the chalk line. Somewhere around 90% of the success of rolling the ball down the target line is from the face angle at impact, so if the ball does not roll down the line, the player knows if the face was open or closed. Most of the best players I have worked with in the putter lab – for face angle at address and impact – use some kind of face angle drill like this as a primary tool when they practice. What do you think about the answers from Bill Price and Duane Anderson? Have thoughts or opinions? Join us in the THP Forum where golfers are debating and discussing this interview right now. If you would like to learn more about how the TaylorMade Spider Tour line of putters came to be, THP TV has a great episode shot at the Kingdom in Carlsbad, CA you can see below. I am not a huge dj fan, but loved watching him putt better last week. really cool story on choosing a putter and i think i might try that somehow. Great read. I certainly agree that “putting is very personal and the mental aspect plays a large role”. Even small tweaks to the equipment can help in the “mental” department. Very interesting article! I’ve definitely seen a lot of what they mentioned to be true in respect to different sight lines working for different players. Really good read and cool to see TM on THP also. Thanks for bringing that interview to the forum Josh. Some of the TM comments are spot on and make sense. I still think players tinker more than just Jan-Mar as indicated. In terms of sight lines with putters, it is truly player dependent. I struggle with a sight line and prefer a single dot or line on the top. Excellent read. The chalk line test is something I need to try. I’m curious how long this lasts for. DJ has tinkered quite a bit when things go south and as a player comes in waves on the green. Still the most intoxicating player to watch on tour, and the worst interview in all of golf, but if he is putting well, look out. That was a fun and informative read. Great job Josh! Fantastic information from Taylormade. The sight line data is enlightening!! Their thoughts on drills make a lot of sense, being able visually identify a line and seeing which sightline type helps the player get the ball on line the easiest is something more of us should be doing. I guess the fall at Augusta really tools it’s toll. Glad to hear DJ went in and got some help. I hope he doesn’t switch putters mid season. Some interesting ideas in that piece, well done! really interested to see if Taylor Made puts out a new alignment based on this. Very interesting, thanks for the TM interview and article. Great job that was a fantastic interview and very informative. The only downfall is I want a Tour Red but I have to have a sight line. I was messing around a few months ago at DSG with one and was nailing everything. I put it down to the putting green and luck. Also I’d just picked up a new Ping and didn’t want to complicate the relationship. My bank account hopes they don’t offer these with a sight line anytime soon. But then again. DJ had two, perpendicular sightlines on his Spider putter; TaylorMade calls it a T-line.